Happy to have been invited to be part of the new international photography platform Art Photo Index (API), developed by Santa Fe’s renowned photo-eye. Art Photo Index (API) is a visual index of important art and documentary photographers, their images and their websites from throughout the world. 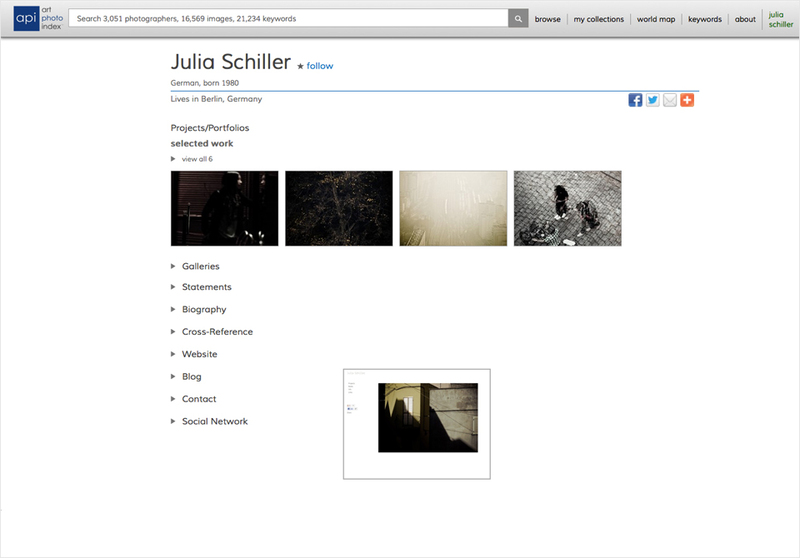 The API search tool focuses only on vetted art and documentary photographers and their work, making it the ideal search engine for our discerning audience of curators, gallery directors, publishers, editors, picture researchers, collectors and others who love art and documentary photography. The photographers included in Art Photo Index have been selected as a result of their accomplishments in the art or documentary photography field. Many of those included have been published by major photobook publishers or serious art photography magazines. Some have received awards given by art and documentary photography organizations. Others are represented by major art photography galleries. This entry was posted in Photography, Photography Platform and tagged Art Photo Index (API), Art photography, Documentary photography, photo-eye, Photography Search Engine, Santa Fe, Visual Index. Bookmark the permalink.